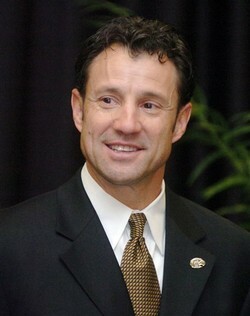 With the first pick in the 2012 College Football draft, the Tar Heels select… Larry Fedora, University of Southern Mississippi! Today, Fedora is expected to put pen to paper and ink as Carolina’s coach of the future. So who is this guy? For a school whose last hire made a big splash with Butch Davis, Fedora is a relatively unknown coaching candidate; after all, he doesn’t come with NFL head coaching AND national championship experience. As a Tar Heel, should you be excited about this, or depressed at the sad, sad state of the program? To find out, I traded emails, faux-Grantland style, with TRB site editor Will Earnhardt. So the timing of this is either fortuitous or awful. I’m studying for a physics test, which is roughly equivalent to having the stomach flu and throwing up so many times your stomach hurts to the point where you’re are simply bathing in your own acid. With that image in mind, after doing some research on the guy I’m feeling cautiously optimistic. Disclaimer: before looking into this guy, I had never heard his name before. On the surface, Fedora is a spread-offense coach (finally) who is walking into the rare situation where we actually have talent on offense, more or less, to match the scheme. Yeah, the spread excels with a mobile quarterback and Renner isn’t exactly Mike Vick, but we do have A.J. Blue (who can pass) and Marquise Williams coming off a redshirt year. Maybe they can spell Renner with the faster Blue or Williams, kind of like LSU does sometimes. Except with less-good players. As I see it, UNC has a few big challenges in the next few years. The first is coping with whatever BS penalty the NCAA imposes over UNC’s already-draconian sanctions (by the way, what the hell NCAA! How come Miami – MIAMI! – gets players cleared in 6 days and it takes you over a YEAR to pull your thumbs out of your collective butts!? ); running a squeaky-clean program during the probationary period should go without saying. The second is to put butts in the seats – and consequently, dollars into the program. UNC’s fan interest in football took a bomb of a left hook this year with uninspiring, boring play. Yeah, our defense will be suspect next year, but at least we’ll have a somewhat exciting offense. One interesting part will be to see what kind of staff he brings in. I don’t know what Fedora’s rep is as a recruiter, though I hear it’s above-average (but how many coaches do you know that land ostensibly good jobs like UNC while being a bad recruiter? ), so the OC and DC he brings in are of paramount importance. One name I hear tossed around is Ron Zook…. It was nice while it lasted, Coach! Kinda. I actually wouldn’t mind seeing Withers stick around to coach the defense, though I’m sure he’ll look for a head coaching position somewhere. If nothing else, the students will have some baller game-day attire to wear. Well, much of the praise of Fedora stems from the fact that his offense is well balanced, both at Southern Miss and as the Offensive Coordinator at Oklahoma State. That should help considering we’re returning one of, if not THE best running backs in the ACC. What has me a little concerned is running a squeaky clean program. I’m not sure if it was just the environment of Hattiesburg, or if it’s the type of player that Fedora recruits, but his program hasn’t exactly operated out of the spotlight of the law. Just last fall, 3 players were shot in an apparently gang-related incident while hanging out at a nightclub they supposedly weren’t permitted to be at in the first place. That’s just one of numerous instances that have been heard of surrounding the program at Southern Miss in recent years. Say what you want about the transgressions that occurred during Butch Davis’ tenure, but we didn’t have players getting shot, or involved in gang-related crime. In regards to recruiting, he did bring 5-star wide receiver DeAndre Brown to Southern Miss – the first 5-star to ever commit to USM – and he typically landed the some of the best recruiting classes among the “mid-majors,” to borrow a basketball term. Hopefully that translates to success in Chapel Hill, but I’m not too worried about that in general. UNC recruited fairly well under Bunting, so he can’t be worse than that. It’s doubtful in my opinion that Withers will stick around. I suspect he will look for another gig and I wouldn’t be surprised if he went to the NFL as an assistant. I think this season showed he wasn’t quite ready for a head coaching gig, so unless it’s a small school, I’m not sure anyone will want to hire him. Maybe we can do a straight up trade with Southern Miss and let Withers go there? Yeah, that gang thing worried me too. But – and I don’t mean to sound like a snob here – you have a university that is very well-known for its general adherence to the “right way” of doing things firing its coach for wrongdoing. I would assume that the university, and Cunningham, would do super-duper double due diligence in vetting that the incident was isolated and not a institutional thing even tangentially. Right? I mean, you wouldn’t touch a guy that could get you in trouble with a thirty-foot pole. Of course, there’s another answer: maybe they just don’t care. Maybe the UNC athletic department finally wised up after the debacle that was the cooperation-filled NCAA investigation this past year and decided, “you know what? To hell with it. If this guy somehow gets us in hot water, we’ll stonewall the NCAA next time. Good luck finding the bodies, Emmert.” I’m not actually sure how I’d feel about that hypothetical becoming reality; probably a mix of shame and righteous vindictiveness. The other thing that I thought of in between emails was that while this upcoming year is probably going to be a decent one for us (new coach means players play hard, loaded offense, okay defense, Little Sisters of the Poor schedule), I worry that UNC will have a huge dropoff in 2013, continuing for a couple of years. Any time you drastically change the system, it takes a few years to get the “right” players in for that system, especially when transitioning to the spread. Imagine if Fedora was coming into a situation where the first running option was Ryan Houston. That’d last all of seventeen seconds. I think we have the horses to compete in spite of the system change next year, but I think we’ll struggle mightily after that. I think I speak for both Will and myself when I say our initial response to the hiring of the Blue Hatter is a somewhat optimistic “meh.” The stat-centric website Coaches By The Numbers agrees, rating UNC’s hire of Fedora a C+, though they thought Auburn OC Gus Malzahn was a better hire, which I think is questionable and a push at best. I was never a fan of Malzahn. Of course, as the new season approaches next summer, I’ll undoubtedly get more and more excited – because, as Mr. Seawright eloquently put it yesterday, that’s what fans do. One other thing: Aside from one stellar season – this past one – at USM, Fedora’s record at other schools has been middling. Granted, he rarely stuck around long enough to fully implement his system until USM, but with a lack of empirical evidence of winning it’s going to take me a little while to come around. I can’t help but wonder of Fedora is a beneficiary of what I call the JaMarcus Russell effect: Russell had a mind-blowingly transcendental end-of-season, big-stage bowl game and immediately vaulted into consideration for the #1 pick. Before that game, Russell was much lower on everyone’s draft boards. I mean, you can value the big game poise, but it shouldn’t completely change your evaluation of a player. We all know what happened to JaMarcus. Fedora, after a good season at USM that incredibly included losses to UAB and Marshall, beat Houston in its conference championship. Normally, eighty people would have watched this game, but because Houston had Case Keenum (a Heisman candidate), a lot more people saw Fedora’s spread punish Houston’s defense to the tune of 49-28. That had to excite the powers that be in Chapel Hill. If nothing else, I’m DEFINITELY excited for the hats. In my next post, I’ll put up a detailed analysis of Fedora’s spread offense, because a lot of people don’t understand what the spread offense actually is, and the incredible variation you can have from system to system. Stay tuned. This entry was posted in Miscellaneous, UNC and tagged Gus Malzahn, Larry Fedora, Nate Friedman, spread offense, UNC Football, Will Earnhardt. Bookmark the permalink. One Response to LARRY FEDORA!!! …Who?